The graphics are good, but that’s a given. Saying a first-person game has good graphics is like trying to sell a guy on the idea of a blind date by telling him the girl doesn’t smell bad. Of course the graphics are good. These days, even the terrible games have awesome graphics. I’m going to nitpick the engine a bit here, but let me start by saying that the Doom engine is a fantastic piece of technology. This is the second game I’ve seen that used it, and taken together the two games show us a lot about what the engine can and can’t do. It’s interesting to see the Doom engine in another context. It turns out that a lot of the look of the world in Doom was the result of the engine, not artistic direction. The “everything made of dull metal and plastic” look remains, and I don’t think you can get the engine to do anything else. I’ve never seen it do wood, for example, and I can’t help but wonder how the engine would pull it off without making it look like formica. Here we are outside in broad daylight, but the ground directly underneath the bridge is pitch black. One of my gripes with the engine is the way that a room can have a light source of sun-like luminance at the center and still be pitch black in the corners. There is no way around this: I’ve played with the editor and I can see that the wonderful unified lighting system (which is a real boon and great breakthrough for all sorts of technical reasons) has this one annoying limitation, which is that shadows are absolute. Imagine this: You are in direct sunlight, at high noon, out in the open. Now you have an awning sticking out from the side of a building. Using the Doom engine, you will need to use your flashlight to see stuff under that awning. This is obviously not realistic, but is the annoying result of those thechnological tradeoffs we keep making to make our videogames look pretty. Probably this will be resolved in the next-gen engine, but for now you’ll be giving your flashlight a lot of use. The reason for this is that light doesn’t bounce off of surfaces, so anything that isn’t directly illuminated will be pitch black. (Top) The similar lighting behavior on these objects makes it look like they are all made from the same stuff. 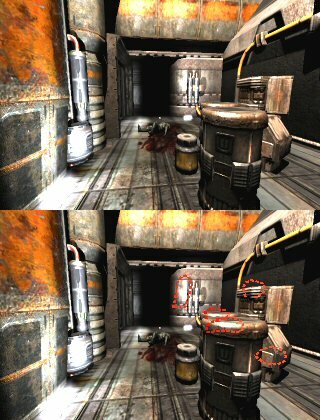 (Bottom) The specular highlights have been circled just to show you what I’m talking about. The other thing that surprised me was the uniform specular lighting. The problem is this: All of the shiny stuff in the world (which is almost everything you see that is not sky or dirt) has a bit of a gleam to it; a blob of light that serves as an approximation of a reflection of the light source. This is a common effect and is often called a “specular highlight”. If you want the object to appear to be very smooth (like crystal ball or a freshly waxed car) you make the gleam a very small, precise dot. If you want the object to still be shiny but have a coarse surface (like an upholstered couch or a stainless steel bowl) then you make the gleam a broad, fuzzy blob of light. The problem with this iteration of the Doom engine is that all objects have the same level of “polish” or “smoothness”. You can adjust how bright the reflection is, but not how tight or diffuse the reflection is. There is just one universal setting for all objects. If they made this universal smoothness too smooth, then it would look like everything in the world was brand-new, wet, or had been given a fresh coat of wax. If they made it too diffuse it would have made everything too plain and the effect would be lost. So, they selected one global value somewhere in the middle and stuck with it. After a while the eye notices this. We’re used to seeing some objects with more shine than others, and seeing every single object and surface in the room give off the same exact specular highlight makes it feel like it’s all made from the same stuff. Even if one surface is painted to look like diamond-plate steel and another like plastic, their specular behavior tells our eyes they are just the same material in different colors. John Carmack mentioned after the release of Doom that he was working on this, but I guess the changes didn’t make it in time for Quake 4. (Top) This is what the game normally looks like. How big is the room? What’s going on in here? (Bottom) After adding a few lights, we can see this place is kind of cool. My biggest complaint about the game is the pervasive darkness. In Doom the place was relentlessly dark because the base lost power, but in Quake 4 you are ostensibly attacking an operational enemy location. Do the Strogg really fumble around in the dark like blind men? On three different occasions I blundered over a ledge and fell to my death because I couldn’t see where I was going. Darkness is fine if you want to create a sense of fear, but restraint is needed. Going into a dark room is frightening. Being in a dark room is frustrating and boring. Using some cheat codes I was able to add some lights to the more difficult rooms and discovered that there is a lot of cool stuff hidden in the darkness. The place looked a lot more interesting and I was finally able to get a feel for the area, instead of peering at the world a little slice at a time through my flashlight beam. What is the point of artists making detailed rooms when we can’t see any of it? Might as well make the rooms simple empty cubes. They did a wonderful job of preserving the original industrial feel of the Strogg homeworld established in Quake 2. The games are generations apart in terms of graphics engines, and I wondered how well the original would translate. By borrowing just a few sound effects and some architectural cues, they really managed to capture the gritty style of the original. Five Months Later: Looks like I was wrong about how the engine worked: After a graphics card update, I see that the pitch-black areas are not pitch black any longer. Dark, sure. But the game doesn’t have the perfect shadows in broad daylight effect it had before. I assume this was a result of some wacky settings somewhere along the line. The game is a lot more fun now. Interesting. I haven’t managed to get around to any of the Doom 3 engine games yet but that explains why I feel like the characters look really “off” — At least when you can see actual flesh instead of combat gear. I stopped playing games sometimes after Quake 2 came out, but I still enjoy reading about them from time to time (nostalgia? ), and you write very well. Thanks. Perhaps it is because I am tired, but the opening to this post made me break into a giggling fit. In the screenshots above, it looks like you increased either the gamma or the brightness. You should leave these at defauly values and instead use the console command “r_lightscale” and set it to 3 or 4 or even 5. This works for DOOM3 as well, it increases the intensity of light entities, but does not wash things out with too much brightness or gamma. Try it.